(FSB Magazine) -- The CEO of a Southern California software company recently contacted FSB to trumpet the success of his new product. It had about 400 users at a dozen small companies and had just received a glowing review in a top industry trade magazine. But he and his co-founder were tiptoeing around a matter that they regarded as so sensitive that they spoke about it only on condition that we not print their names: Except for four developers in India, their company has no employees. Not even their customers know their secret. Thanks to a $99-a-month phone system and an actress who does voice-overs, a professional recording greets all callers and routes them to the company's sales, tech support, or marketing departments - but nine times out of ten, they'll reach the CEO. The CEO used $150 software to create an online video demonstration that walks potential customers through his product's features, giving his Web site a flashy, moneyed feel. And Web-based software lets customers see the CEO's computer desktop live, so he can personally demo the software without an in-person meeting. The cost: $70 a year. "If customers knew we were so small," says the CEO, "they wouldn't take us seriously." Once upon a time it was easy to tell the difference between a small business and a large competitor: Big firms had access to more capital, diverse markets, better technology, and economies of scale; small companies had to make do with whatever they could afford. But as technology has advanced, that distinction has blurred. Just as mainframe computers gave way to cheap PCs on every desk, Yellow Pages ads are being replaced by low-cost Web sites, and regional sales forces by search terms purchased from Google and Yahoo. Harvard Business School professor Clayton Christensen cites overnight shipping as another of history's great leveler, giving smaller manufacturers the ability to send parts across the globe in less than a day and robbing big firms of a competitive advantage. The past couple of years have ushered in a new wave of tools for entrepreneurs who want to play big, as software and service providers have begun to adapt their offerings-previously available only to large firms-for small businesses. "The attitude used to be, 'We're going to take this product we have for enterprise, strip out a lot of functionality, and small business is going to have to use it,'" says Chris Hazelton, senior analyst at IDC, an IT market-research firm based in Framingham, Mass. "Now companies are either building products specifically for small business or making the products modular so they're lower-priced and scalable." The result: startup multinationals. Small firms with bigtime online security. Low-profile companies using high-powered software to perfect their Web sites. No-name startups with big-name shipping partners. Over the next several pages you'll meet entrepreneurs who are taking advantage of new technologies and strategies and learning a powerful lesson: It's never been easier to play big. As a furniture designer for Pottery Barn, Edgar Blazona used to log 100,000 miles of air travel every year. Sometimes his giant employer would let him use a corporate jet for an emergency trip to Asia. He would spend 30 hours in the air, roundtrip, for a vendor visit that lasted just a few hours. Now Blazona, 35, is owner and CEO of a children's-furniture firm called ElevateHome, and he can't spare the time or money for constant international flights. But that doesn't mean he has given up on overseas manufacturing. Blazona depends on two factories - one in Thailand and one in India - for all of ElevateHome's wares. He closely monitors production at both locations. 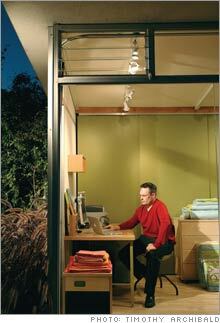 And he does all that without leaving his home office, a modular dwelling that he built in his backyard in Berkeley. Blazona's firm is a prime example of a new breed of small business: startup multinationals, pipsqueak firms with single-digit headcounts whose managers establish close relationships with and keep watchful eyes on foreign vendors without ever leaving their offices. "There's been an explosion of collaborative business software in the past few years," says Ram Iyer, CEO of Argea (argea.com), an outsourcing consulting firm based in Princeton, N.J. "It's created a total revolution in what small businesses are able to accomplish overseas." The software, Blazona says, cuts down on confusion, costly mistakes, and the need to ship designs overnight across the globe. The software costs $50 a month, and Blazona says it will save his company about $100,000 this year in travel and courier expenses. Blazona also expects his company to turn a profit by the end of 2006 after only 18 months in operation. ElevateHome's first line of kids' furniture and bedding will be launched this fall under the name True Modern (truemodern.com). Blazona projects $750,000 in revenues in 2006, not a lot of money for a typical multinational, but enough for ElevateHome - with its three employees, home office, and low overhead - to operate in the black. "When you're as lean as we are," Blazona says, "turning a profit should be relatively easy." WebEx isn't the only new software available to small businesses with worldwide ambitions. Oracle, of Redwood Shores, Calif., and German giant SAP, makers of enterprise software that was once the sole domain of large corporations that could afford at least $1 million in startup costs, have released scaled-down versions for small businesses. Such packages tend to be more expensive than those of WebEx - roughly $75,000 to buy, install, and customize - and using them requires some technical expertise. But they allow globe-spanning small businesses access to the same kind of firepower as their larger counterparts. 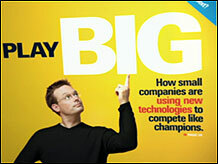 Stephen Holt, for instance, signed up for SAP's small-business package when it was introduced three years ago. Holt had founded YakPak - a company that makes messenger bags, backpacks, and totes - in 1988, but despite a growing client base of hip urbanites, his firm was not living up to its potential. Holt's clients, many of them boutique clothing stores, tended to order small quantities of each item, and Holt struggled with the inefficiency of transmitting orders - via phone and e-mail - between vendors in China and Taiwan and his factory in El Salvador, a setup that routinely left him with too much or too little fabric to fill his orders. But SAP's Business One provided real-time oversight of YakPak's entire operation, which has streamlined his supply chain. Now orders are logged directly into the company's computer system and instantly tallied using SAP's software, taking the guesswork out of ordering inventory from Asian vendors. Holt projects that YakPak (yakpak.com) has been able to cut raw material costs by 20 percent, saving $300,000 a year. Recently YakPak opened a new warehouse in Houston. SAP's software weaves the entire supply chain - from customer orders to raw material orders to factory production to shipping finished goods to retailers - into a smooth and transparent process. Now YakPak's large roster of boutique customers dependably receive their small-lot orders. "Our global operation used to be more seat of the pants," says Holt, 39. "Now we're chasing the Dell model. We make only what is ordered." Software has helped other small companies manage networks of overseas factories that once could be run only by giant firms. China Manufacturing Network (sourceglobally.com), a ten-employee firm in Irvine, Calif., draws on 90 factories in China, Malaysia, and Singapore to produce such esoteric devices as the lens housings of industrial lasers for clients like Amphenol and Teledyne. To coordinate the activities of so many parties, China Manufacturing's co-founder and CEO, Everette Phillips, 46, turned to NetSuite, an on-demand, scalable enterprise software product. Phillips says he uses the software to track activity in each factory, so he can always determine how to use them most efficiently. Jonelle Raffino had a mess on her hands. Her family-owned startup, South West Trading (soysilk.com), had stirred up demand for its line of yarns made from bamboo, corn, and soy fibers, but Raffino couldn't supply it fast enough. The factory wasn't the issue - it could crank out 500 to 800 metric tons of yarn each month. Problem was, Raffino's skeins were stuck somewhere between her manufacturer in China and her warehouse in Phoenix, and she had no easy way to track them down. "We had little confidence we could get product when we needed it, so we overbought," says Raffino, 41. She estimates her company kept $1 million worth of excess inventory to ensure it could meet orders. "Our supply line was a complete disaster." That's an understatement. In China, Raffino had no way to combine products from different factories into one oceangoing container, so she paid a freight forwarder $1,000 to $2,000 to send each small shipment separately, at an annual cost of more than $100,000. For roughly $17,000 a year, she hired a customs agent to help move the products through ports, but because her goods were lumped in a container with other firms' small orders, they were vulnerable to delay if the paperwork from even one of those other companies wasn't in order. A trucking company picked up the goods in the Port of Los Angeles, but Raffino worried that her firm's small size made her a low priority; those shipments cost about $20,000 a year and could take as long as 18 days to get to Phoenix. Playing big may sound appealing to an entrepreneur, but coordinating an international business can open her to some of the same gnarly logistics challenges that corporate giants have wrestled with for decades. Out-of-sync international suppliers. Lost shipments. Tie-ups at customs. All those can translate into wasted money and long delays, which can send customers to more reliable - and usually larger - competitors. The challenges become even more complicated when working with picky clients. "Wal-Mart has very stringent controls. They want their orders packed a particular way, shipped a particular day, tagged in a certain way," says Keith Biondo, publisher of Inbound Logistics magazine (inboundlogistics.com). "If you're a 12-person company, where do you develop that kind of expertise? You don't. You turn to an outside company." Fortunately, more - and more capable - vendors have sprung up to provide those services to small businesses. Known as third-party logistics (or "3PL," in the industry lingo) providers, the firms fly, truck, and sail goods all the way from factories in Asia to customers' doorsteps - often without even passing through the small businesses that generated the orders. These services have been available to Fortune 500 companies for years, but logistics providers have begun to see the small-business sector as a growing market opportunity. "In the past five years there has been a migration of these services to medium- and smaller-sized companies," says Richard Armstrong, chairman of Armstrong & Assoc., a Stoughton, Wis., market research and consulting firm specializing in logistics (3plogistics.com). "There's been a major realization that if you can do a good job for small businesses, they're more inclined to form partnerships and loyalties that will generate business for years to come." DHL, FedEx, and UPS have been early leaders in the small-business segment, with their ability to handle packages of any size, while other players that serve small business, such as Seattle-based Expeditors (expeditors.com), mostly deal with heavier freight of about 100 pounds or more. Raffino solved her problem by turning to UPS, which in recent years has begun aggressively marketing the work of its Supply Chain Solutions division to small-business clients. (Raffino interviewed several companies but went with UPS because it was the only one that could offer a solution for all her logistics problems.) Now the UPS facility in Shanghai combines Raffino's orders from various factories into one container, handles all the customs paperwork, and trucks the goods to Phoenix. The same volume of goods that once required four shipments, which would trickle in unpredictably over a month's time and cost as much as $9,400, now costs about $3,600 and reliably takes 21 days to travel from China to Raffino's doorstep. At every stage Raffino can track her shipments live online. In August she added a service that will ship deliveries directly from Shanghai to her distributors in Australia and Britain rather than through Phoenix. The transition wasn't seamless - both the Chinese language barrier and the lingo of the shipping industry made early communications difficult - but Raffino says that most of the problems were ironed out by the time the second shipment was sent. While Raffino won't give revenue figures for her eight-person company, she says it grew 500 percent last year and 45 percent this year and is profitable. "Because we've smoothed out this process, we order just what we need when we need it, and that's freed up capital to build the business," says Raffino. This year, for instance, South West Trading launched a line of stuffed animals made with its signature soy-based yarn. The right logistics partners can also give small businesses the flexibility to grow. Bulbs.com, a Worcester, Mass., online retailer of light bulbs and fixtures, has seen its revenue grow by 50 percent annually for the past three years. But it faced a conundrum as it tried to find a way to offer two-day shipping on its most popular products for its growing customer base; shipping from its New England warehouse cost too much, but renting a full warehouse in a more central location could result in acres of wasted space. The company turned to DHL, which allows Bulbs.com to rent space - only as much as it needs in a given month - in a warehouse in Wilmington, Ohio. Bulbs.com's ordering system automatically calculates which orders should ship from the Ohio warehouse and electronically transmits data for those orders to DHL, which fills and ships the orders for two-day delivery by ground. DHL's handling costs are around 12 times higher than if the shipment is sent from its own warehouse, but postage is less, resulting in better delivery times for about the same amount of money. David Kenney was headed into a conference room to pitch his software to a prospective client when he saw a pair of smug-looking representatives from a big rival, Adobe, strolling out. But Kenny wasn't worried. "We jumped in and did a live demo and said, 'For $200,000 we can do what we're showing you today.'" He won the sale for his small company, Efficient Forms, whose software automates the process of filling out forms for companies such as big insurers. Over the past 18 months it has snagged some 300 insurance clients away from such giant competitors as Accenture and Microsoft. "You get the jaw dropping. Then they say, 'You mean you're telling me this little company can do this?'" Kenney says. With just 40 employees, Efficient Forms (efficientforms.com) rang up $3 million in sales last year, and Kenney expects to top $7 million for 2006. He attributes much of his success to a piece of technology known as a virtual private network, or VPN. It is a secure remote Internet connection that enables two or more parties to communicate in encrypted fashion regardless of location. Efficient Forms relies on its VPN - a Cisco 3000 VPN appliance that cost about $2,000 two years ago - to securely and remotely zing data back and forth between its home base in Littleton, Colo., its production site 30 miles away, and the Web sites of all its far-flung clients and would-be customers. Relationship managers at Fiserv Investment Services, for instance, uses Efficient Forms' automated service to maintain the records pertaining to its $40 billion worth of retirement and custodial accounts, sensitive data that seamlessly whizzes between its offices. As recently as five years ago, such secure data transmission required installing dedicated telephone lines, which could cost between $500 and $2,000 a month. VPNs can cost as little as $200 a month and provide the same or better functionality. Leading providers of VPN systems for small business include Linksys and SonicWall. Efficient Forms chose Cisco because its VPN system promised to be easy to upgrade, and the familiarity of its brand would help impress large clients. The affordability of VPNs has opened up new markets for smaller companies. "It kind of levels the playing field," says Ann Westerheim, president of Ekaru (ekaru.com), a small-business IT consultancy in Westford, Mass. "It doesn't matter if you're not a huge company with a full-blown IT department. VPN technology is becoming so ubiquitous and affordable that small companies don't need to make a major investment." Not everyone is sanguine about VPNs, which transmit data over the Internet instead of over a dedicated line. "If you were a doctor or a small medical company transmitting personal data, you wouldn't want to open yourself up to any legal liability, given the inherent risk of eavesdropping on network traffic," notes Kevin Corado, formerly an independent IT consultant and now IT director of children's shoe manufacturer Morgan & Milo in Boston. But VPN proponents argue that because VPN technology automatically encrypts all data, there is no cause for concern. When Carlisle Wide Plank Floors launched its new Web site last spring, the phone stopped ringing. Normally that would be a bad sign. For 40 years, Carlisle had relied primarily on print advertisements to generate calls to its toll-free number. It hadn't been a particularly efficient practice in recent years; the wood-flooring company, based in Stoddard, N.H., kept increasing its ad budget just to maintain the same number of leads. Having a Web site is one thing; building an effective one is another matter entirely. Before its $60,000 makeover, Carlisle's site was just another placeholder on the Web. Today it represents a fast-growing new revenue stream - and shows how new software and strategies can help entrepreneurs project a big-company image while grabbing more customers. "The Web hasn't changed the heart of our business," says Connie Glover, the company's director of marketing (who recently left the company), "but it has dramatically changed the way we do business." Carlisle's old site emphasized its rootsy New England appeal. The home page included a signature photo of a rocking chair atop a white-pine floor. Just one problem: That approach wasn't attracting customers. Glover found that 37 percent of Web surfers who landed on the home page failed to click through to the site's content. "We were appearing one-dimensional," says Glover. To reflect Carlisle's diverse offerings, designers created a Flash animation that cycles through photos of the company's floors in homes ranging from rustic to modern minimalist. "We needed the look of the site to give people the confidence to buy from us, no matter where they are in the country," says Don Carlisle, 38, the flooring company's president and son of the founder. The new philosophy has paid off. Today the average visitor to the site clicks through ten pages before leaving. But first those customers have to be able to find the site. Before the redesign, thanks to the vagaries of search-engine technology - a complex set of algorithms that determines placement based on a site's popularity and authority - a Google search for "Carlisle Wide Plank Floors" often didn't show the company's Web address on the first page of results. Jeff Greenhouse, president of Philadelphia-based Singularity Design (singularitydesign.com), developed the new site using search-engine optimization, the art of making one's Web site naturally appear higher on the results of sites such as Google and Yahoo. For example, most search engines look at file names, page titles, and the density of keywords on a page. The number of sites that link to a page also helps boost its perceived relevance. Greenhouse used the phrase "antique chestnut" 13 times on Carlisle's antique-chestnut-floor page. He added links to the site's other pages at the bottom of each page, making each site appear more relevant. Carlisle Wide Plank Floors also pays about $50,000 annually for Google's AdWords product, which generates "sponsored search" links for the company when anyone searches for terms such as "wide plank" or "hardwood" on Google. Even small businesses with effective Web sites are taking advantage of affordable new technologies to fine-tune their offerings and squeeze even more revenue out of them. For years Carrot Ink, a Dallas-based online retailer of printer cartridges, treated its Web site design like a guessing game: CEO John Howard says there was little way of knowing which design elements were drawing customers. But now Howard has removed the guesswork by paying $3,000 to $5,000 a month to find out which elements of his site best drive sales. Howard uses Offermatica, a two-year-old San Francisco startup that randomly directs customers to variations of Carrot's site to see which version is most effective. This type of research, called "A/B" or "multivariate" testing, was once available only through expensive software designed for large corporations. But now services such as Offermatica's - or that of its competitors, which include Optimost and Vertster - are being offered over the Web for low monthly fees. Howard designed home pages with different introductions - "Welcome to Carrot Ink," "Start Here," "Buy Ink for Less," or "Find Your Cartridge" - and different graphics. One showed a photo of carrots sprouting out of a printer, while another replaced the carrots with a dollar bill. Then Offermatica randomly sent carrotink.com visitors to competing versions of the site. Howard found that the most successful combination - a headline of "Find Your Cartridge" and an image of a printer with carrots - led 18 percent more visitors to buy ink than his previous design had done. The test took just 30 minutes for Howard to set up. "We do $6 million in annual sales," he says. "If I can get even a 1 percent increase in sales, Offermatica basically pays for itself." Not every test yields those kinds of results, he admits, but over the past two years of using Offermatica, Howard says that he has more than broken even on his investment. Small businesses are also turning to Web analytics software - from market leader WebTrends or competitors such as Clicktracks or Google Analytics - to learn how visitors are finding, browsing, and leaving their sites. These services produce detailed charts: how many users each ad is driving to a small company's site, where in an ordering process customers are abandoning their purchases, and which sequence of pages draws the most users. Most providers charge a monthly fee based on the number of features and amount of Web site traffic, although for the past year Google has offered its program free to users with fewer than five million page hits a month. How does your company use technology to compete against bigger players and keep costs down? Do you think larger companies have a big advantage over smaller businesses like yours? Share your strategies and ideas by writing to fsb_mail@timeinc.com.